Ready to make an Impact on the lanes?!?! The Ebonite Impact high performance bowling ball is ready to help you make that impact. 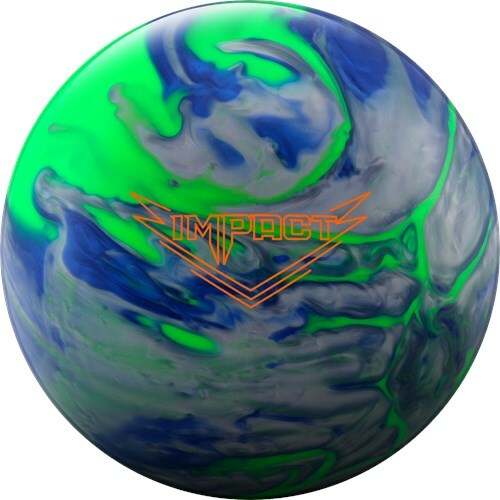 This ball uses the CB-2 asymmetric core and GSV-1 Hybrid coverstock to ease down the lane and then react big on the backend when facing medium to heavy oiled lanes. Had an opportunity to try this bad boy on a typical house shot. Ball was extremely clean through the heads but when it saw the friction, Watch Out!. This ball is angular and good when you want to try to open up the lanes. Especially during transition or when the lanes start to break down and you want to migrate left. The ball is very responsive to the dry areas of a lane. I would recommend this ball on any medium or medium heavy patter. Ebonite has a winner on their hands with the Impact. Likes:I like the ease of getting this piece through the fronts to a very defined strong backend motion. Very angular and doesn't give up when opened up with extremely angles. When I saw this ball was announced, I didn't know exactly what to expect. I was intrigued by the GSV-1 Hybrid cover being used, a cover I've had success with both the Verdict Pearl and Choice. What I got was possibly the quickest response to friction ball I own. I went with my lower flare layout of 50 by 5 by 80, placing the pin below my middle finger, MB out towards my VAL. This layout just saves a ton of energy for the breakpoint. I keep the surface of this ball on the shiny side, just to embrace that quickness off the spot. I've tried this ball on a lot of conditions and I feel the best motion I've had was on a house shot with this where I start kind of in the middle of the lane and just keep going left and circling it more and more. For a high-end ball, I do get to throw all 3 games on a 5 person THS league pretty often. If you need something super strong off the spot, the Impact could be what you need through the pins. Likes: For a pearl ball the Impact is very smooth through the front with a strong continuous back end. A pin down drilling will smooth this ball out, but still allow you to move left during transition or to open up the lane. I had very high hopes for this ball when I heard about it. I usually enjoy hybrid covers as they are a good in between for when solids just aren't quite finishing but bigger pearl balls are a bit to much on the back end. This ball seems to still be a big stronger off the pattern then I expected. I drilled mine pin up, the demo ball drill basically, and found it to be to angular for the THS compared to my choice pearl. I have had some success with it on sport patterns however. When the ball is in the pocket though, it definitely hits hard! Page created in 0.678 seconds with 22 queries.